We were returning against an outbound tide after my sea trial of the 49-foot American Tug, a coastal cruiser and Tomco Marine’s largest vessel to date. 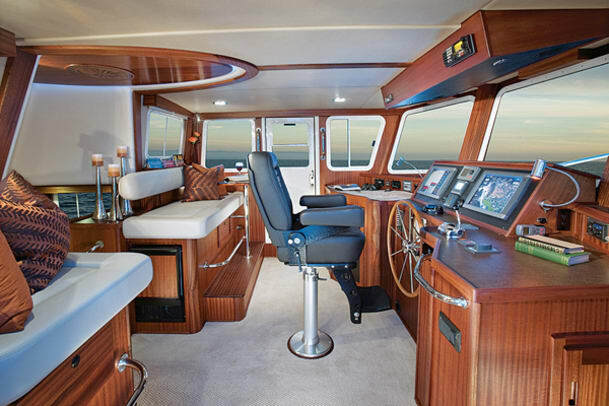 The semidisplacement hull has a draft of 4&apos;10", which meant we were cutting our clearance close; the bathometric chart on one of the dual Garmin 15-inch touchscreen displays was telling us that average low tide would leave a depth of just four feet. 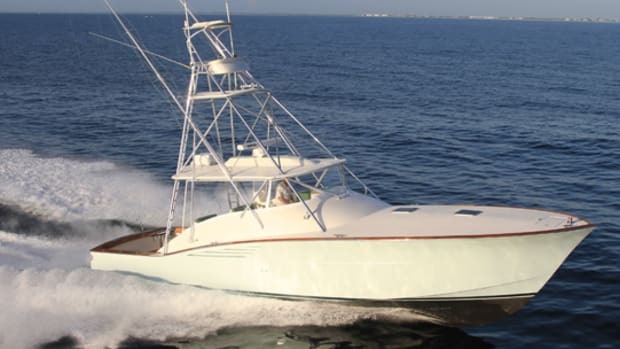 I began to maneuver the boat into place as we watched the readout from the Garmin GM10 depthsounder oscillate between three and four. “It’s going to be a negative-two tide today,” said Dilworth flatly as I edged her forward. The test had gone smoothly. 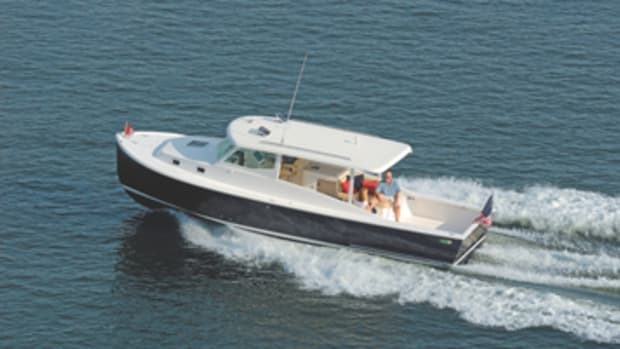 Skagit Bay had been calm and silent except for the purr of the single 575-hp Volvo Penta D9 diesel. Snow clung to the surrounding mountains but we were warm in the sapele mahogany-lined pilothouse, even without the aid of the standard 35,000-Btu Hurricane diesel furnace (which you can replace with a 48,000-Btu air-conditioning system). The 28-inch Stazo wheel is an excellent size for cruising, and reached both my palms and shoes as I reclined in the black Llebroc helm chair. 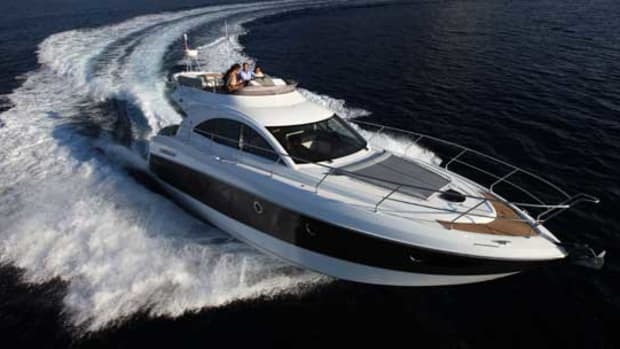 With the single-lever Volvo Penta control pointed toward the base of the reverse-angle windows, she’d topped out at 22.2 mph while burning 28 gph. (Cruising folk will want to slow to 11.0 mph, where she consumes a mere 6.9 gph.) 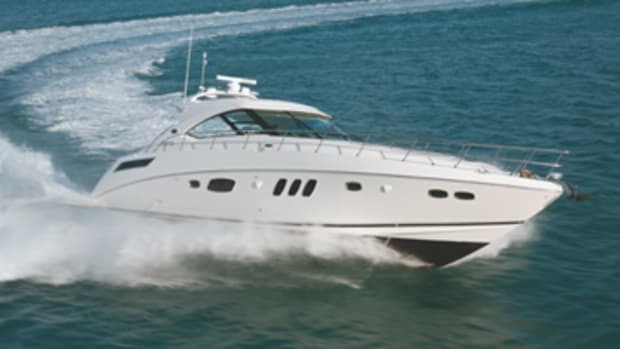 At her maximum rpm of 2520, the pilothouse decibel reading was a laudably low 75 decibels, 65 dB-A being the level of normal conversation. However, the silence didn’t extend to the master stateroom where a reading of 90 dB-A filtered into the meter. This was probably because the two inches of Soundown accoustical insulation on the forward (master stateroom) bulkead were inadequate to overcome the sound of the engine, which is only about three feet away. Tomco fairly points out, however, that no one is likely to reside in the master when the boat is at WOT. 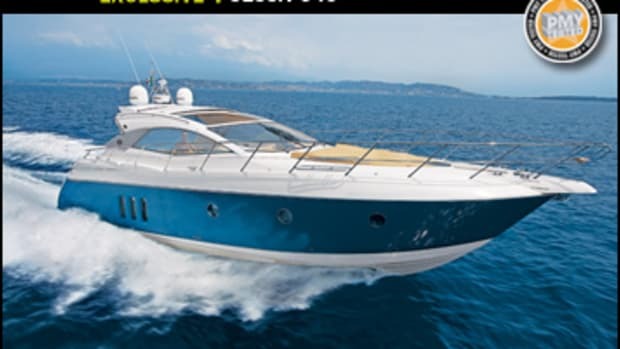 I also felt that at 4 1/4 turns lock to lock, her hydraulic steering was a bit slow at WOT for my taste. 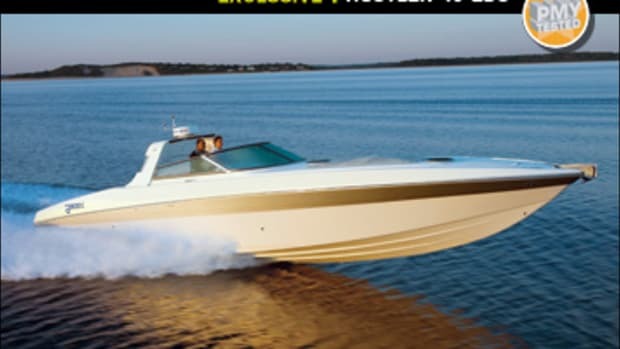 But then few people will run this boat for extended periods at that speed. At all other rpm settings, helm response was prompt and her full-length keel maintained straight tracking, which I appreciated when I prepared to enter the narrow, shoaling channel. The cut was marked by a pair of large range markers, and as I lined them up on my stern, I noticed that this was the only place aboard that lacked excellent sightlines; I had to look out of the pilothouse’s port and starboard rear windows to get a clear view. The cause of the blind spot is actually some adept structural engineering and well worth the mild inconvenience. Tomco lays up the superstructure in one large piece to prevent leaks along an outside seam, and to make it strong without adding internal pillars (which would further obfuscate the view aft and break up the flow of the saloon) it adds an egg-shape piece it calls “the stack.” Adorned on the inside with an oval teak plank that the company refers to as “the surfboard,” it allows the saloon ceiling to cantilever over the pilothouse, producing an interior with more headroom, a stronger cabin top, and leak-free overheads. I began to work my way up the channel as I mentally reviewed a checklist of conceivable “what-ifs.” My first thought was what if our only engine quit? There was no secondary propulsion system, and since the bow and stern thrusters and windlass all operate off a hydraulic system powered directly from the flywheel, an engine failure would essentially mean the loss of maneuverability. 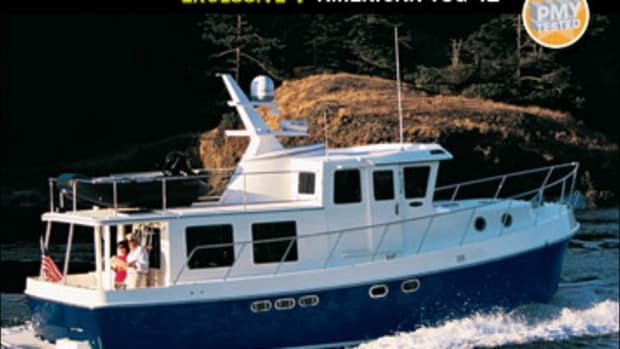 Of course, the main cause of diesel-engine failure is bad fuel, and to ensure that’s not a problem, the 49 has duplex Racors mounted at the base of the access hatch on the aft engine bulkhead. The Racors are fed from both 400-gallon saddle tanks—which are themselves joined by a gravity-fed line, making them self-leveling—so you can switch from one Racor to the other with a twist of a valve as you drain their settling bowls of water or change their filter elements, all while the engine is running. Tomco installed spigots on the filter bowls that can be turned by hand, and to make doubly sure there’s never a fuel issue, a 210-gph Reverso fuel-polishing system is also standard. Dealing with other problems should be a lot easier thanks to 3&apos;10" headroom, a standard Kobalt stainless steel toolbox complete with basic tools, and 360-degree access to the powerplant. But the root cause for my unease was the possibility of running aground. But I’d seen the running surface of Hull No. 2 back at the shop with its 32.5x31.5 five-blade Hung Shen nibral prop protected by the keel and Tide Marine’s axe-head rudders secured to the keel’s skeg. So I took comfort in knowing that even if I did rub the muck, steering and propulsion should remain intact. Once the grid is in place and cured, workers install Nida-Core soles, which are both lighter and stronger than the typical plywood flooring. “We build thicker than standards recommend,” boasts Taitano. So with the vessel tracking straight, good sightlines, a protected prop, and a hull ready for any incidental impact, I began to ease her over the silt bar, feeling confident that even if we hit, this boat could handle it. Of course, just because one is confident doesn’t mean he shouldn’t also be prudent. So I did what any sensible captain would do: I handed the wheel back over to Dilworth, the owner’s rep, who has full insurance coverage. About 30 seconds later, we were on the other side of the shallows. 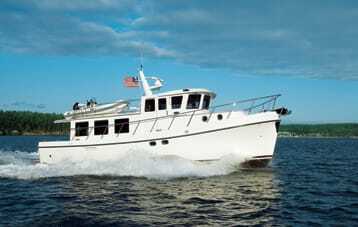 I took back the wheel, and as we approached the dock, gave a quick burst of her standard bow and stern thrusters, spun the 49 around the outside pier, and nestled her side-to between a pair of her sisterships. 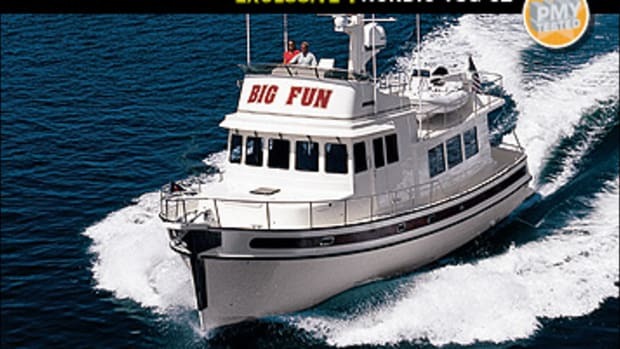 If only all boats were so confidence-inspiring. Although it may seem like a rather odd item to put on a vessel that cruises in the permanent overcast of the Pacific Northwest, the pair of SunSei solar panels aboard our test boat provide quite a bit of extra power—up to 14.5 amps, to be exact. Tomco wanted to ensure that the panels could power one of the dual Nova Kool ‘fridges and simultaneously take care of all of the saloon lighting. (That’s one of the main reasons the builder chose LEDs). But that’s not the only way to keep the batteries full on this boat. 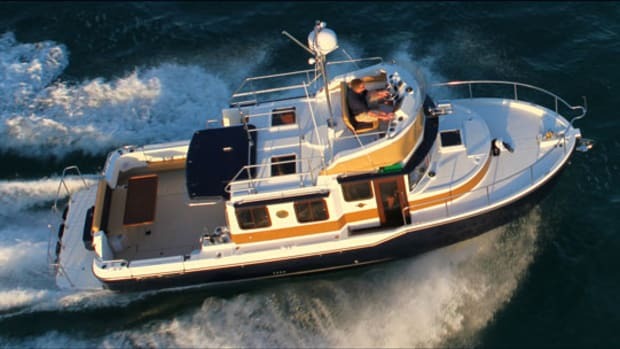 The company custom-built an assembly on the Volvo Penta D9’s flywheel, that not only powers the hydraulics,but also a second alternator that charges just the four 8D AGM house batteries. And you can check the charge level of the system on the Xantrex helm monitor that also controls the 2,000-watt inverter.